The Wi-Fi SSID and password for the football World Cup's security centre were exposed – after a photograph of host nation Brazil's federal police brass inadvertently captured the creds written on a white board. 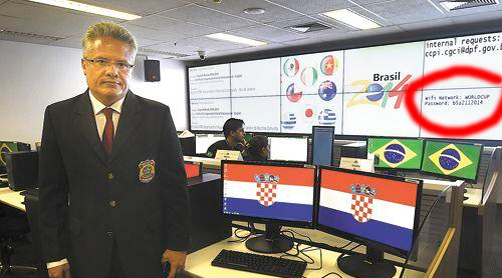 The snap appeared in newspaper Correio Braziliense, and showed the head of international cooperation Luiz Cravo Dorea standing in the multi-million dollar security centre used to watch video feeds from surveillance cameras around the event's venues. In the background of the pic, it is possible to read the SSID "WORLD CUP" and password "b5a2112014", leet speak for Brazil 2014. The shot has since been re-Tweeted over 2,300 times.